Condo is well furnished and close to several restaurants. Nice unit. Rental manager was very accommodating. Toaster did not work. Perfect spring break vacation! The condo easily fit our party of 8, including 4 teens, 2 school agents and 2 adults. Beautiful views of the gulf from private balcony were enjoyed every morning while we drank our coffee. Short walk to the beach and the kids appreciated the boogie boards and sand toys available. I only wish the outdoor pool had still been heatedit was too cold for my littles to enjoy. My family of 6 enjoyed our stay at this condo. Parking was easy, getting to the beach was easy, and the wraparound balcony was amazing. Clean, conveniently located .. we would definitely stay again! Thank you! Our stay was perfect. The condo had everything you would need to enjoy the beach. A great view, large balcony, chairs, sand toys, fully equipped kitchen, etc. it is within walking distance to most shops. My family of five loved it! Nothing better than going to sleep and waking up to the sounds of the ocean waves! This was our first time using VRBO. We had a great experience. The unit we rented came as advertised. It had a great location on the beach, was nice and clean and well stocked with any supplies we'd need. The owners were very quick to respond to any questions we had. We'd definitely stay again! Centrally located in the C building. Decorated very nicely with the bay view we love. All you see is water. Owners clearly work hard and care about the condition of the unit and it shows! Best unit weve stayed in at Caribe-4th Spring Break in a row at OBA/Caribe. Highly recommended. The corner condo was beautifully decorated. The process was seamless. The couch needs replacing. We met with our three grown children and grandkids. Breath taking views. Seriously considering making it an annual trip. Amenities were great! A very nice indoor pool and outdoor pools, one for older children and adults and a 1 foot deep waiting pool for a little ones. The lazy river feature was very nice. Parking and elevators made it very simple for arrival, departure, unloading, and loading. Condo was clean and nice. 3rd bedroom a little small, but otherwise was a great place to stay for 5. We stayed at this gorgeous rental the last week of March. It was a last minute decision, and WOW was it incredible. My husband & I along with our 5 kids (ages 4-13) and my parents enjoyed this well-equipped, immaculate home. It's located in beautiful Romar Cottages, and the location is steps from a fantastic boardwalk to the beach or gorgeous pool. Our kids loved the "kiddie" table with toys & the bins of sand toys offered. The kitchen was well stocked for our stay, and the bedroom arrangements were perfect. The house is tastefully decorated, and just felt like home. We hope to visit again soon! We all said there wasn't anything that we would change. Great stay at a great place. Love Phoenix X!!! Great place! The pics are accurate and the view is fantastic! A couple of things we noted - 1. Our indoor pool at our condo tower was not working for the first three days of our trip (water heater out). However, we were able to use the heated indoor pool in the other tower. 2. The only thing about the room was the remotes to the TVs are worn and need to be replaced. (Not a huge deal to us since we didnt vacation there to watch TV, but could be a little annoying if you did plan on movie nights). Otherwise, great time and experience! We had the best week! The house was simply gorgeous and just steps from the beach. The porch was fantastic for early mornings and evening sitting. Plenty of space for 16 of us. Beautiful furnishings and everything we needed was provided. . The rental company was professional, friendly, and easily reached. We will be back for sure! We had a great stay at Seawind 1507! Love the location and amenities. Hope to come back soon! We were more than happy with everything about the condo & overall experience. The large balcony was probably our favorite feature. The handle broke on the Master Bath toilet, but they had it repaired within an hour. We highly recommend & would definitely stay here again. Thank you! The condo exceeded our expectations!!! The view was spectacular, unit was spotless and tastefully decorated and the location was excellent. It is a family-friendly complex and offers a quiet, relaxing environment on the beach. 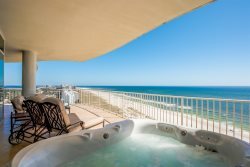 Although it's away from the more crowded areas of Orange Beach/Gulf Shores, it's still a close drive to shopping, restaurants and attractions. Nearby is Gulf Shores State Park (we rented bikes and explored the Backcountry Trail). Those who love live music will be thrilled that it's within walking distance of the Flora-Bama Bar. Owners/management of the unit provided excellent and easy-to-follow information about check-in and check-out and were readily available when we had a question. One of the best rental experiences we've had!!! We had a great experience from check-in to check-out! The place is very spacious with plenty of room to spread out and a huge balcony with amazing views and a hot tub. Our group consisted of 6 adults and 6 kids and the room layout gave everyone their own space and privacy. The kitchen area is awesome for entertaining with a massive island and table. The beach, indoor pool and outdoor pool are great options for any kind if weather and there are a lot of great restaurants right down the road. We would definately stay again and we all had a great time! Thank you for the opportunity to visit!!! Will definitely stay again! The Condo was beautiful and very comfortable. The kitchen was very well stocked and the beds were very comfortable. The property has amazing amenities! Best vacation ever!! !